Unlike a full bathroom that gets lots of use every day, a powder room is smaller and usually the bathroom that guests will use when visiting your home. Design experts say that homeowners can really take chances when choosing fixtures, colors and accessories for a powder room in order to create a beautiful space they're proud to show off. Most powder rooms average just 4-feet by 5-feet, so they offer homeowners the opportunity to make big changes without spending a lot of money. 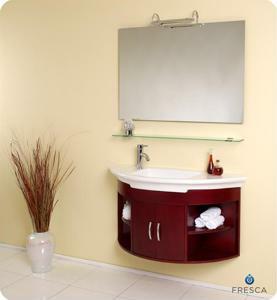 A new bathroom vanity, faucet and accessories can instantly change the look of the room. And, because it's a smaller space, many people feel comfortable splurging on more expensive items. It's not necessary to incorporate a lot of storage space in a powder room. After all, items such as hand towels and extra toilet paper should be easily accessible for guests using the room. As for color, design experts say it's okay to experiment and go bold. "Select a deep, dramatic hue for the walls," Kohler's Lynn Schrage advises via Kohler.com. "Don't be concerned about closing in this small space. An intense wall or ceiling color can make a dramatic impact in the room and add an element of surprise off the hallway."